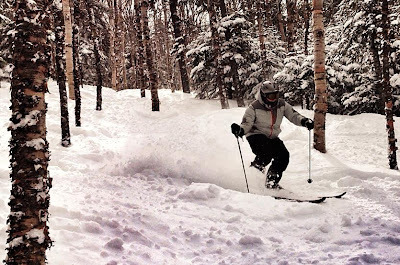 @MaineSkiFamily old man & three other middle-aged dudes did mid-week getaway to Saddleback to harvest some 18" plus of blower powder. Needless to say it was an excellent day! It snowed most of the day picking up a couple more inches during our ski day. 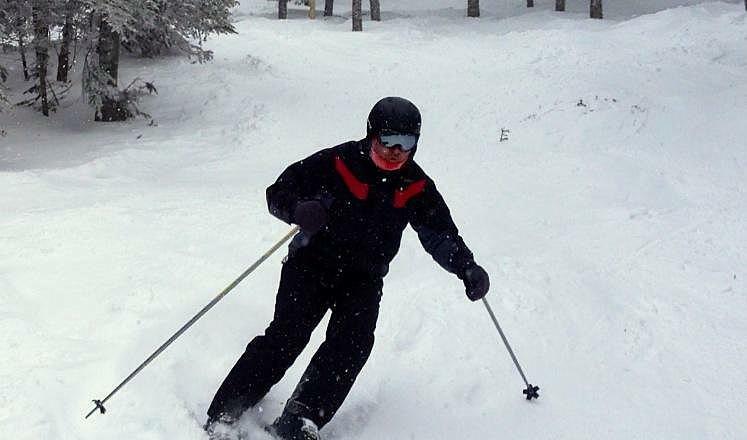 The new snow was very light which is a bit unusual for Maine in general and March snowstorms in particular. It was very easy to move around and there was a lot of it. Our first runs of the day down an untracked Parmacheenee Bell was easy knee deep the whole way. Many times during the day I would look down to my skis and I could not see them. It was great! We bounced all over the mountain and had a blast. The woods were particularly good. It was a bit windy mid-mountain on up, so that meant the snow blew around some. While the head walls of Governor, Wardens Worry, Frost Bite and Black Beauty were skiable you were skiing over ice and around rocks and other obstacles. Once you made it a 100 yards in or so, things got fluffy again. So while it wasn't a perfect day it was pretty darn close. I give it a 9.5. Looking at the Saddleback weather forecast, the temps are going to stay below freezing through the weekend. This snow will groom up real nice and the snow in the woods and the sheltered natural trails will stay nice and fresh. It is going to be a great weekend at Saddleback!